The fiber club is shipping this morning and it’s going to be the last one for awhile. It’s been great fun, and I will be continuing it, but after a solid year I need a wee break. I’d have powered through if it wasn’t for our planned move, but this has been a great excuse to allow myself to rest up a bit. Expect to see the club back for sale in July for an August-October run unless something crazy happens. I’ll keep everyone posted. Everyone who was a member this time has a slot reserved for next time and Iâ€™ll give plenty of notice so you can grab your slot. I hope you all love the fiber I’ve dyed up this time. It’s silky, puffy stuff in colors outside my comfort zone, and what do you know? I love it. There’s a big bag of scraps I can’t wait to spin up. Want to see? Want to see? No glove hint this month as I didn’t get new gloves after last time. It was something else, as usual. I met a ton of awesome people, saw old friends, did a ton of fun stuff with all of them, and had a great time. There’s a Flickr Group with tons of photos and a Ravelry group, as well. 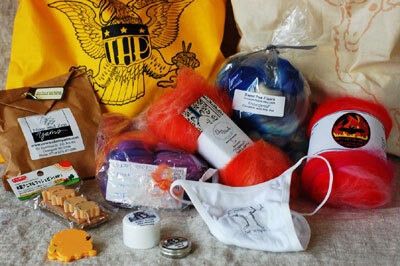 And the bags- yellow commemorates Yarn School and sheep is a gift from Felicia of Sweet Pea Fibers (teacher gift). The students got more, including hand-dyed fiber by me and Sarah of Maisy Day Handspun. The underwear are killing me. (Okay, that sounds bad. I’m not wearing them. They kill me with their funniness.) Since I was one of the goodie bag-packers, I got to coordinate my fibers so that I could make one big Yarn School yarn. I can’t wait! I got a bunch of knitting done on the plane and have a new handspun project idea that’s freaking me out with happiness, so expect to see more of me around here, including Actual Shop Updates. Will club members get a chance to renew when you do your next round in July??? Have a nice “break!” Even though it includes moving, I hope you get a little chance to relax some and do some fibering for you for a change. i have to go to yarn school one year. if only to get fancy underpants. Have a nice break. Let me know when the move happens and I’ll bring down the truck. I hope you have a wonderful break! It is very deserved. But I will say that I’m already looking forward to your return. Best wishes on your move and look forward to future fibre clubs! This will give me some time to knit/weave some of the beautiful wool from past months! Ooooo, I am LOVING that club fiber. A pox on me for not signing up for this round. It was so awesome to meet you last week! I tried my hardest not to be a superfan. I was subsequently exhausted when I get home. Beaming you vibes for a simply great move! I am, like, drooling over this.